By Damien | May 11, 2010. Anne Devlin is probably one of the most important, yet unsung, Irish heroes. That’s Mícheál Ó Doibhilín’s view anyway. The guide, who works in Kilmainham Jail, devotes a large part of his life to Devlin. And who but a man who carries the same name as the Irish Republican woman could be more suitable for this task – after all, Doibhilín is the Irish translation of Devlin. Ó Doibhilín knows everything about Devlin. He knows about her life as one of the “hidden” leaders of the 1798’s rebellion, her life in prison and her life in the Liberties. “In fact, Anne Devlin’s life in the Liberties is not the most exciting part of her life,” he says. The reason: Devlin only moved to the Liberties after her release from prison at the age of 26. 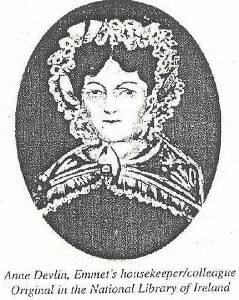 Before that, she took an active role in the United Irishmen Rebellion. 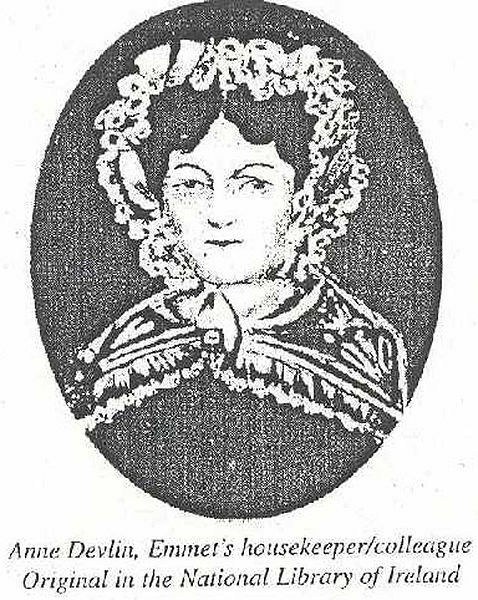 As Robert Emmet’s housekeeper she also came under suspicion by the British Authorities. After being arrested and tortured and enduring several years in prison cells, she was finally released in 1806. She then began to work as a washer-woman, living behind John’s Lane Church in the Liberties. At the end of her life she cleaned public houses, before becoming too sick for work and dying alone in poverty in one of the “worst slums” of Dublin at this time (Little Elbow Lane). Despite this life of hard work and suffering, Anne Devlin’s refusal to speak to the British authorities while in prison may have saved Ireland as we know it today. Thanks to Anne, the leaders of United Irishmen survived, except Robert Emmet who was executed in 1803. More importantly, her ideas where passed on from generation to generation. “This country has a debt to Anne Devlin,” says Mícheál. He himself visits her grave in Glasnevin every year, to lay flowers. He was also the one to initiate a mass in her honour on the first Sunday after 18 September, to mark the anniversary of her death. This mass is celebrated at 12 am in St Catherine’s Church, Meath Street, close to the place where she used to live. After the mass people go and visit her grave. Thanks for the article. It is interesting that, although all sources say the portrait of Anne is in the National Library it is not! No-one knows where it is. I believe it went over the border but, almost certainly, it has disintegrated by now and been disposed of, but no-one seems particularly concerned about this, other than myself There is a silhouette of Anne in the Michael Dwyer (her cousin) case in the Soldiers and Chiefs exhibition in Collins’ Barracks.